Most financial services or transactions can eventually hurt your credit score if mismanaged. In the case of payday loans, sometimes called payday advances, while most payday lenders do not pull your credit report to approve you for a payday loan or to check for past defaults, these lenders do not report the loan or the payment or default of the loans to the credit bureaus, according to the Consumer Financial Protection Bureau (CFPB). But, once a default is turned over to a collections agency (who may sue you for the defaulted loans and fees), it then ends up on your credit report and can hurt your credit score for up to seven years, even if you end up paying the collections amount or the judgment against you. But that’s not the real hurt of payday loans according to consumer watchdogs like the CFPB, the Federal Trade Commission (FTC) and the Center for Responsible Lending (CRL) who are all working to protect consumers from these predatory types of loans. Payday lenders often do no credit check, have no minimum monthly income requirements and only require a valid pay check and a checking account for their instant (or 90-second) approval which makes them appealing to cash-strapped customers. All you have to do is write a check to the lender that includes the amount you want to borrow plus the fee charged for borrowing the money, which could be a $15-$30 flat fee (on average) for every $100 borrowed or it could be stated as an Annual Percentage Rate (APR). According to the CRL, a usual two-week payday loan has an annual interest rate ranging from 391 to 521 percent. The lender gives you your $115 (although some take the fee up front and just give you the amount you borrowed) and then you agree to return and pay back the $115 or have it debited from your bank account. Sounds simple enough, right? But that’s where the trap lies. If you were desperate, you might convince yourself that by next payday you would certainly have the $115 to pay back the loan. But what if you borrowed much more than that? According to the Center for Responsible Lending, these payday loans average $350 and are purposely created as a long-term debt trap. In the 2014 CFPB research report on payday loans, the CFPB found over 80% of payday loans are not repaid on payday and instead are rolled-over or “renewed” for another pay period, each time incurring a new fee. And, for more than 80% of those with repeated loan cycles, the loan size and default rate is more likely to go up the longer the loan cycles are extended. The report found that half of all payday loans last at least 10 loans long and that 64% of new borrowers become renewers. 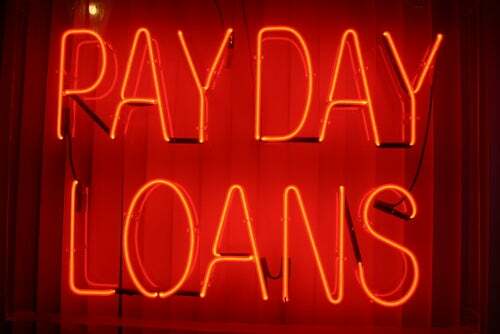 The CRL found that the typical payday borrower remains in payday loan debt even longer, for 212 days of the year. Every time you roll-over that loan you are charged that $15 fee so after 6 pay periods of renewing the loan, your fees are $90 and almost equal to the amount borrowed. Even though payday loan activity generally does not show up on the credit reports from Equifax, Experian, and TransUnion, the CFPB warns some specialty credit reporting agencies might collect some of your payday loan history and that lenders could access this information so it could affect future loan approvals and terms. And, if you don’t repay your loan and your payday loan debt is sold to a debt collection agency, most debt collectors do report accounts in collections to the major national credit bureaus and that would hurt your credit score. And, if any collections agencies or payday lenders sue you to collect unpaid loans and fees and you do not appear in court or you lose the case or do not pay the judgment against you, this information will be recorded on your credit report and impact your score for up to 7 years. Payday loans make each paycheck smaller as you must pay back the amount borrowed plus the fees, making it harder to get out of the payday loan trap and pay your monthly bills based on your real income. And the payday lenders are counting on that to keep you borrowing and paying the fees. The CFPB recently won a $5 million consumer refund against ACE Cash Express, one of the largest U.S. payday lenders for pushing payday borrowers into a debt trap. The CFPB found that ACE used illegal debt collection tactics to pressure overdue borrowers into renewing and re-borrowing amounts they could not afford. If you need help improving your credit score,contact us today.